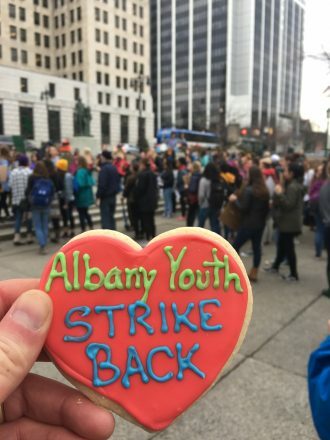 I happened to be in Albany yesterday for the Youth Climate Strike, happening concurrently at 11am all over the world. We showed up just before 11am, and saw hardly anyone there. I’ve been to protests like that; it can be a little demoralizing. But then we heard a ruckus around the corner … and like the cavalry, in marched about 200 high school kids chanting and shouting. My throat caught a little bit in Albany yesterday. How can it be that we adults have abdicated our responsibilities so gravely, that our kids have to come out on a school day and beg for their futures? It was inspiring — and it was also a fearsome public shaming. We haven’t just failed to love our neighbor as ourselves; we’ve failed to adequately love our own children as much as we love gasoline. And the consequences are upon us, an iniquity visited upon our children for countless generations. So, our governor will “carefully review” if our kids get to live on a habitable planet. Now, he could offer to help write such legislation. Especially in the absence of a positive federal role, his leadership would mean something on a national scale. Those who imagine that these kids (and Alexandria Ocasio-Cortez, and Ed Markey, and countless climate scientists) are “politically naive”; that pales in comparison to the less-than-innocent blindness of those who imagine that “moderate” half-measures will save us. At great length, repeatedly, and over the course of decades, we have been warned by the best knowledge available to us. These kids do not demonstrate naiveté: They simply do not accept that “political reality” dooms them to a nasty, brutish and short life on a decimated planet; scrapping for food, water, and shelter in a world of hazards and scarcity. I am exceedingly grateful to, and inspired by, the kids who took yesterday to fight for all of us. I hope every adult leader — in politics and media, at every level — is struck with a moral fear and trembling. We dare not fail at the task ahead of us. 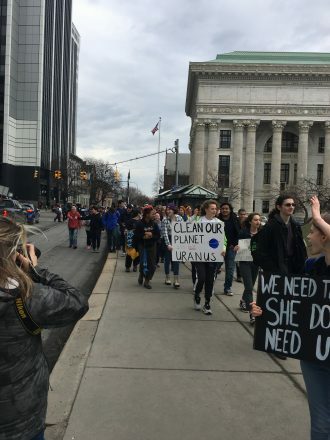 Bravo to all the kids who participated in the Youth Climate Strike! We honor you ALL for your passion and commitment to a sustainable future. My friends in the solar community tell me that they have determined that Baker’s policies will bring MA to 100% renewable energy very, very soon now….. by 2099 or so. This needs a full post. It’s so wildly unacceptable and needs to be wrapped around his neck.